Whether you're looking for tips on how to take your content engagement to the next level, or just how to use ScribbleLive more effectively—we've got your back. 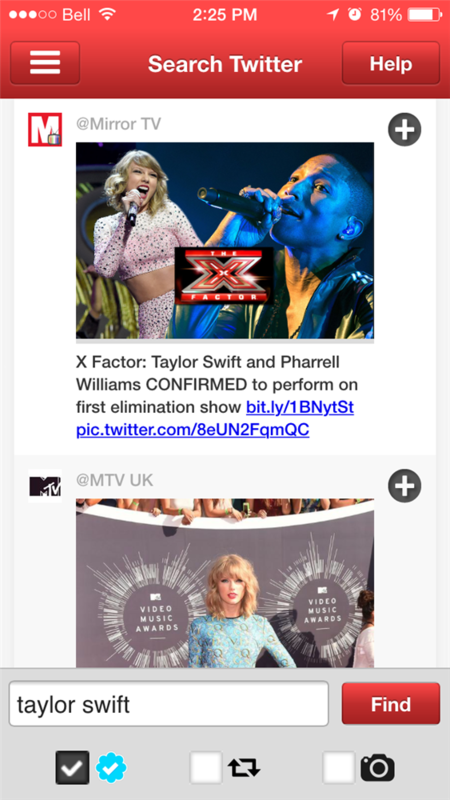 Did you know you can drag and drop content already published in your streams into an advanced post to repurpose it? It's true! Think: Posts you want to highlight, embedded content you want to add context to—all reasons you should take full advantage of the Advanced writing area's ability to drag and drop to create beautiful, engaging content. When you embed content on your site from an external source, often you'll be asked to set the width and height, in pixels. Fixing the pixels, though, can make for a mobile nightmare, as—to put it simply—phone and tablet screens are far smaller than the typical desktop. Enter auto-sized embeds: ScribbleLive allows you to create embeds that auto-scale width and height to fit the content to where you've embedded it, meaning they'll adjust size as needed—such as when viewed on desktop vs. mobile. When you’re on the go, it’s important that your content production be able to go with you. 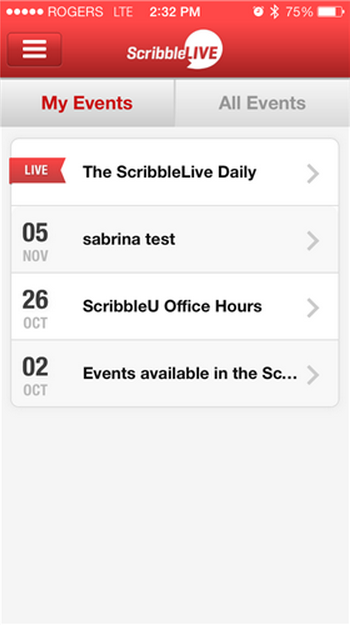 ScribbleLive has apps for iOS and Android available for free in their respective app stores. 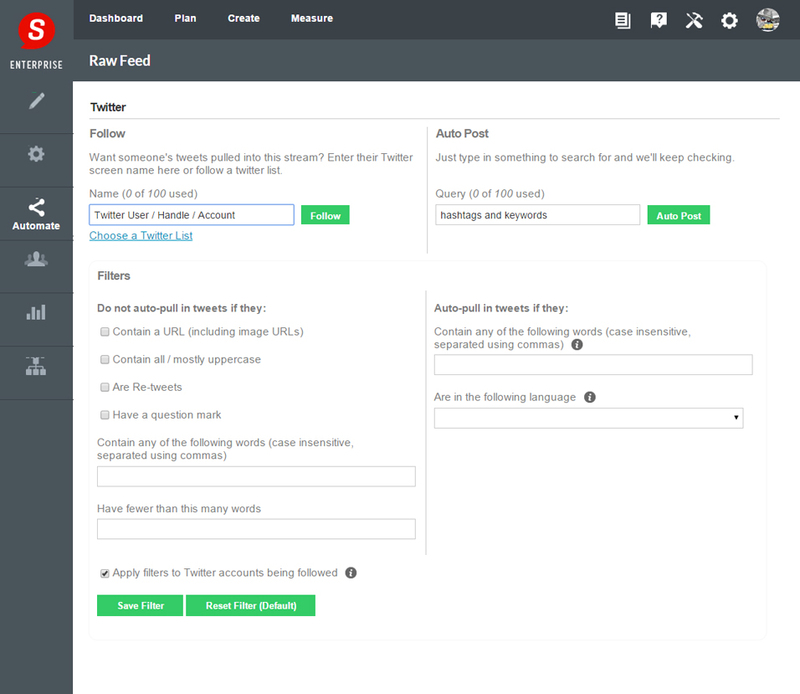 Search and publish content from Twitter. 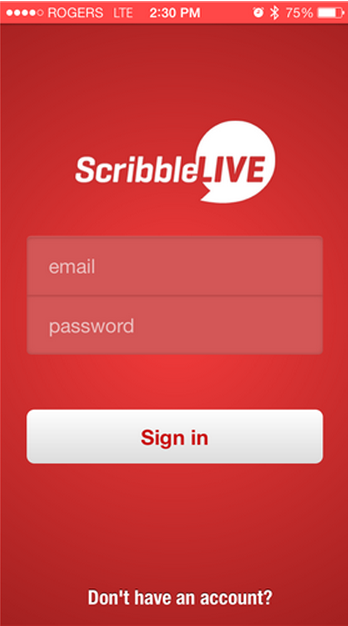 When you open the app, you'll be prompted to log in to your ScribbleLive account. 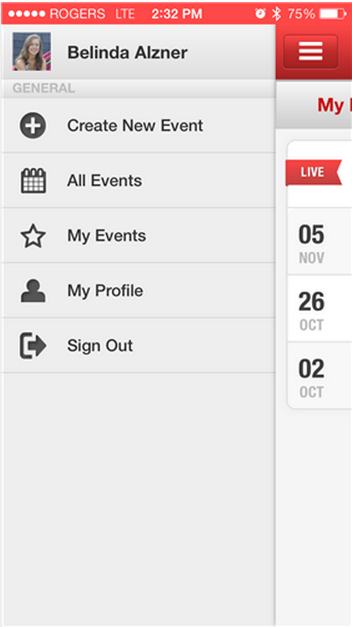 You can access basic stream management controls from the app. Using the app, you can access the streams you've created or have been invited to participate in, as well as all of the streams in your account. Creating text posts is as easy as typing and hitting "Post." Multimedia can be posted to your stream from the app. 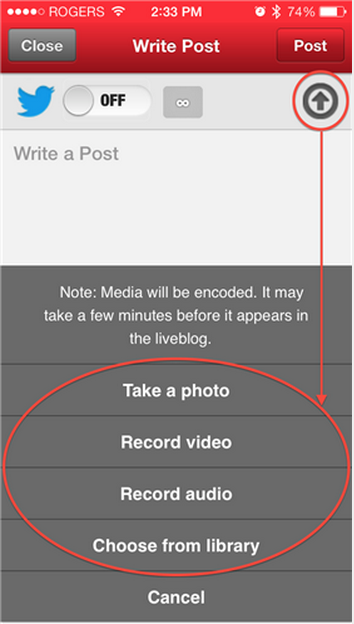 If connected to Wifi, you can record video or audio in-app as well as choose media files from your device's library. Comments and discussion posts can be approved or denied. 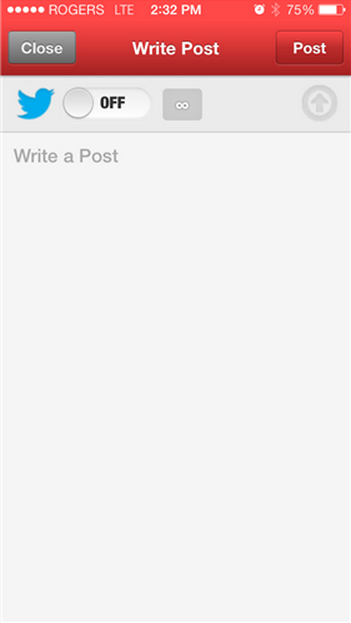 Double tap on a post to open up a menu that will allow you to edit, delete or stick a post to the top of your event. To search content on Twitter, open up the left menu tab and select "Search Twitter." 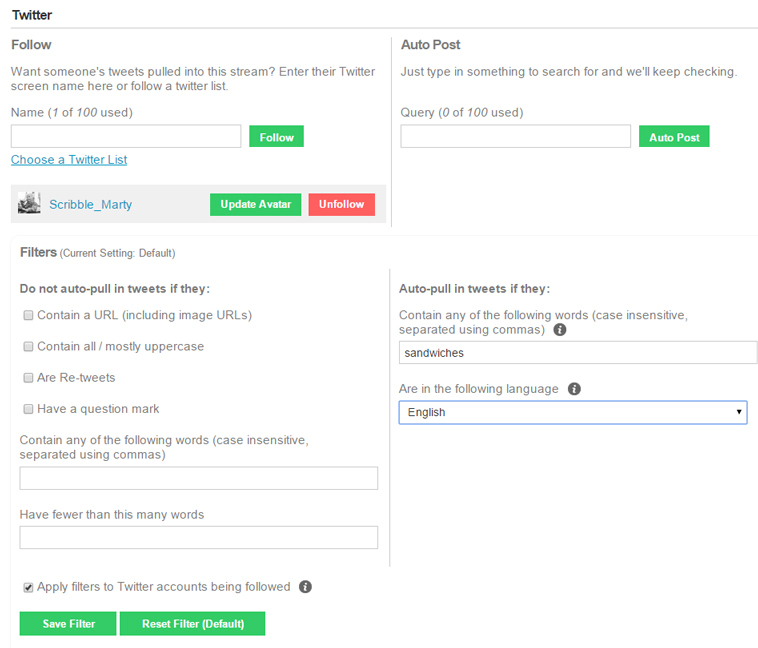 You can do a search for keywords or hashtags on Twitter and filter this search to include only verified accounts, to include retweets and to include only tweets containing photos. The results will show above and just press the + button to add them to your stream. Looking for full functionality? Using an tablet? Log in to ScribbleLive from your mobile browser and access advanced tools such as social curation, LiveArticle, slideshows and real-time analytics. Working on creating content across a variety of streams - and streams that are all somehow related? Trying to manage team collaboration, while creating engaging content across a number of related content experiences or events? Want to schedule and promote all those related streams using Social channels like Twitter, Facebook and LinkedIn? Like to know how those Social channels amplifications are working? ScribbleLive's Projects. Helping you keep your editorial sanity intact, your digital publishing plan on track - all the while, showing you how well your Social promotions really are working (or not). Looking to easily curate some of your brand or organization's Social content - maybe even while you're sleeping? Want to fully leverage and optimize that hashtag campaign you're running? In the market to figure out how to feed only some of the tweets from your corporate Twitter account to your live stream? ScribbleLive can help . . . Help you automate the process. And by using the ScribbleLive platform, its Social Automation feature and its filters, you can also make sure that all the ...'digital garbage'...doesn't end up in your stream and littering your Web property. 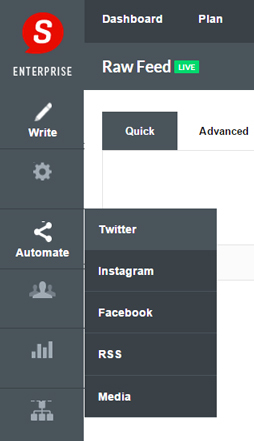 First, from your stream's left sidebar menu, click Automate > Twitter. This is the Twitter automation screen. Here you can auto-follow Twitter accounts and hashtags and apply filters to the tweets being auto-published to your stream (A.K.A. experience or event.) 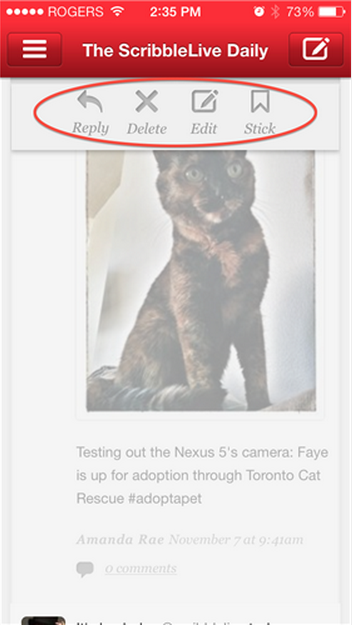 You can use the Automate feature to do the same with Instagram and stuff too. You can be a little bossy with your social content automation too. If you use these two fields on the lower right side of the Automate screen, you can insist that a tweet must have a certain word or words in it to be pulled into your stream. 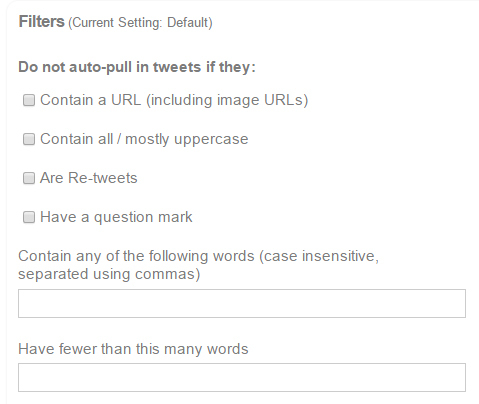 By default, filters only apply to keywords or hashtags being auto-published. 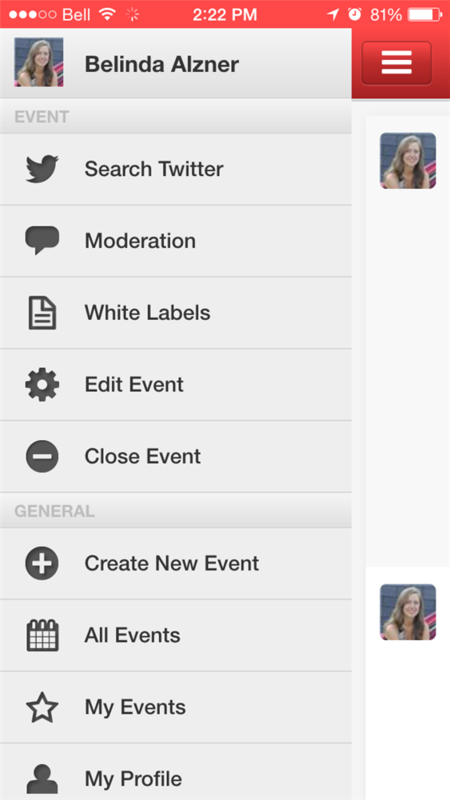 However, by clicking this checkmark, you can apply these filters to the users being followed as well. Finally, at the bottom of the page, click "Save Filter" to save your auto-follow settings, or "Reset Filter (Default)" to undo changes you've made. For example: Here we are auto-following @Scribble_Marty's tweets, but we have specified that his tweets will only be published automatically to our stream if they contain the word sandwiches. Friendly learning nudge: Click on any of the individual images, to get a more focused view of the slide. ScribbleLive's Projects feature makes for easy and effective organization of related streams, team collaboration and content publication and amplification scheduling and measurement. Add to all that; using Projects is a breeze. Let's start learning about putting Projects to work for us, by getting introduced to navigating into and around a Project. Got a few png files you want to leverage? Maybe a jpg - or twenty? Perhaps a few dozen mp4's? No problem. ScribbleLive's new Collections feature makes managing, sharing and publishing your own visual content as easy as one-two-three. If a picture paints a thousand words; then, with Collections, your content is about to become an art gallery . . . of epic real-time engagement. Wondering if it's difficult to create a new Collection and then add digital assets to it? Nope. Not at all. Have a look. Have some digital assets in one Collection that you'd like to copy to another Collection? Or maybe you got images or videos you want to move altogether? Want to publish images or video straight from a Collection to an event? Or, already in the Stream editor and want to grab a few assets from a Collection? No problem. Easy peasy. Click Play. Looking to collect and manage images and videos uploaded to your ScribbleLive event by your audience? Hoping there's a way to do that . . . without any muss or fuss? And we've got your audience-fed Collections feature too. How many times have you found yourself wishing you could go back to that conversation you had just ten minutes ago; to add that perfect quip or zingy one-liner? Share that super-smart insight? Use just the right word or term? But there's no going back . . . to tweak or perfect what's already been said. Except, if you're a ScribbleLive customer. And make that content conversation flow just right. Click here for the non-video explanation. UGC. User-Generated Content. Inviting your audience to share and be a part of the conversation. It's nothing but digital goodness. But we all want digital peace of mind too. 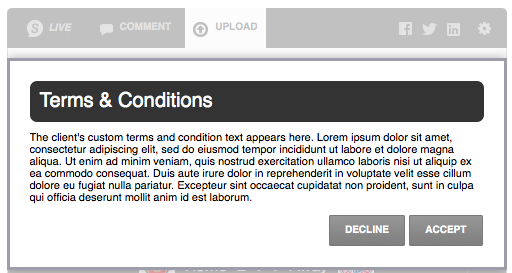 To know what the terms and conditions of content use are, right? Now you, and your audience can have exactly that. 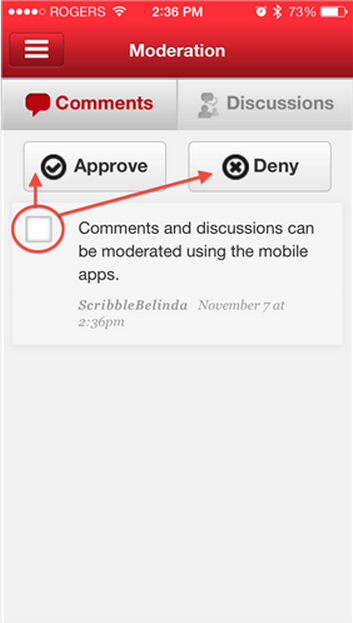 ScribbleLive Engage clients can now enable Rights Management settings for UGC. When this feature is enabled, your audience will be asked to read and agree to your custom "Terms & Conditions" (T&C), prior to proceeding with any of that delicious digital sharing. The T&C text added here will appear for all associated client Streams & Pinboards that have our 'Upload' function turned ON for. Once enabled, your audience will be prompted to read the Terms & Conditions and check the I agree box before they will be able to upload any content. Digital content sharing peace of mind. Now just a few clicks away . . . Ever wish your audience could share ScribbleLive content to LinkedIn? Ever hear the expression, "Your wishes can come true"? ScribbleLive . . . always helping you increase the size of the top of your content marketing funnel.